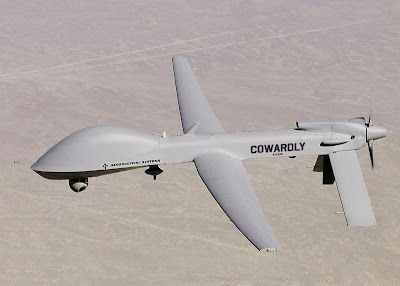 The Bureau of Investigative Journalism estimates that between 2004 and 2013, drone strikes in Pakistan killed between 2,536-3,577 people, of these, it is estimated that 411-884 civilians and 168-197 children have been killed. 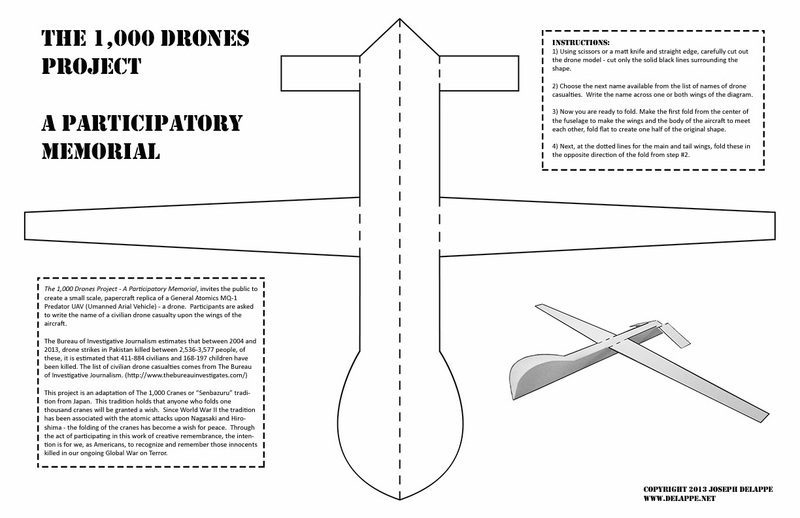 The 1,000 Drones Project - A Participatory Memorial, is the creation of media artist and activist, Joseph DeLappe. 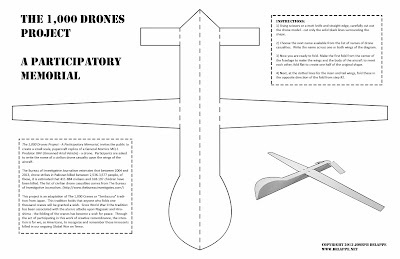 The project invites the public to create a small scale, papercraft replica of a General Atomics MQ-1 Predator UAV (Unmanned Arial Vehicle) - a drone. 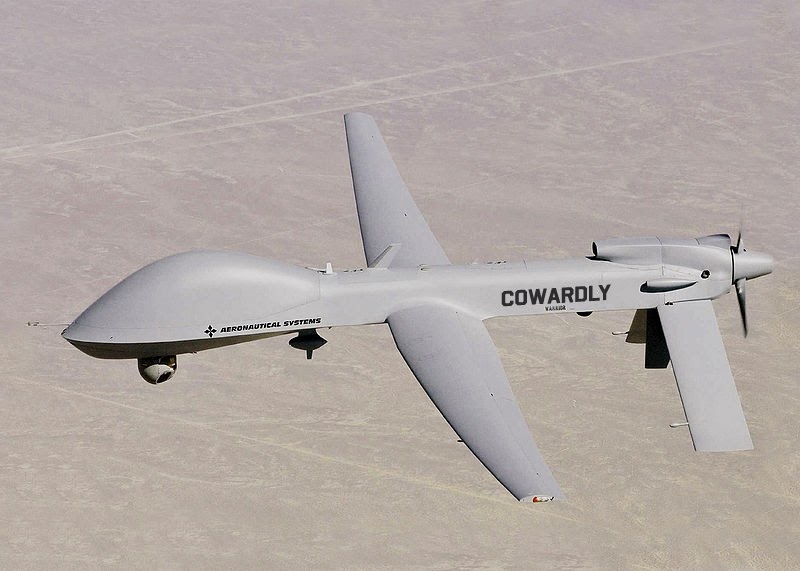 Participants are asked to write the name of a civilian drone casualty upon the wings of the aircraft. This project is an adaptation of The 1,000 Cranes or “Senbazuru” tradition from Japan. 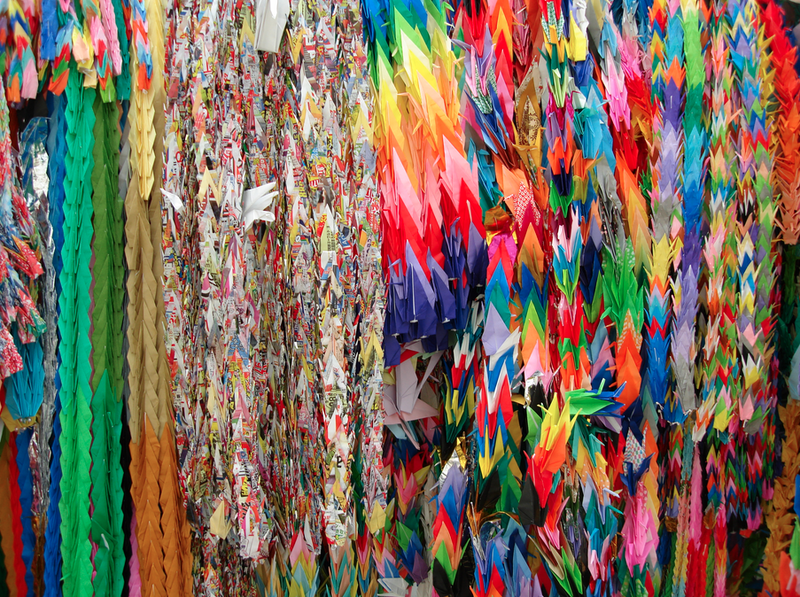 This tradition holds that anyone who folds one thousand cranes will be granted a wish. Since World War II the tradition has been associated with the atomic attacks upon Nagasaki and Hiroshima - the folding of the cranes has become a wish for peace. Through the act of participating in this work of creative remembrance, the intention is for we, as Americans, to recognize and remember those innocents killed in our ongoing Global War on Terror. The resulting 1,000 paper drones are to be displayed in an adapted form similar to those of the Senbazuru tradition - strung one on top of the other in groups, to be hung from the ceiling of the Museum of Fine Arts Florida State University in Tallahassee, for the exhibition "Making Now - Open for Exchange" (February 14th through March 30th, 2014). FSU Department of Art at the launch of the project October 17, 2013.